The music duo brothers Anand-Milind are back! The music duo brothers Anand-Milind are back! They were successful award winning music-directors throughout the eighties and nineties, having composed for around 200 Bollywood films. Remembered for hit soundtracks such as Qayamat se qayamat tai, Dil and Beta, amongst many others, the duo have contributed to film successes for all three of the top Khans and also had a successful partnership with Govinda and David Dhawan. However, the duo could not really make a successful transition into the 21st century, with no memorable soundtracks in the last decade. 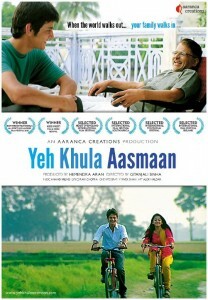 They are now back with the film Yeh Khula Aasmaan, which is due for release on 25th May. The film is inspired by a true story and portrays the extremely challenging phase of an IIT-aspirant young boy on the verge of succumbing to academic failures, and highlights the value of strong familial systems to help nurse bruised young minds. It is an award winning film and is the first ever Bollywood film to have won the Best Foreign Feature Film at the All Sports Los Angeles Film Festival and has also been shortlisted for numerous other international film festivals. The film is directed by newcomer Gitanjali Sinha, who is trained from both the New York Film Academy and Subhash Ghai’s Whistling Woods Film Institute in Mumbai.